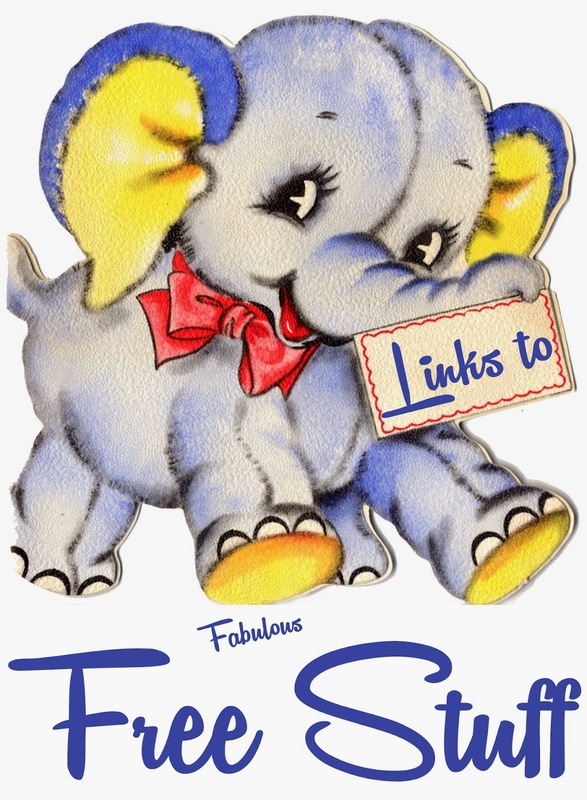 Our lovely friend Vicki at 2 Bags Full has given us all the opportunity to visit new blogs and make new friends. And for me the friendships I have formed have been the most surprising and wonderful aspect of blogging. I feel like I am part of a secret magical world that others don't understand. This little bit of blog world, peopled by artists and craftspeople and those with a love of textiles and fibres and stitching and knitting and all creative pursuits, really is special. It is safe and supportive and nurturing. It is kind and generous and giving in so many ways. Some bloggers share just a small fragment of their 'real lives', others keep completely quiet and all we see is what they make and do. Some bloggers share the trials and tribulations of life and others offer a virtual but loving embrace to help another through the darkest times. Everyone celebrates the happy times, rejoices in the triumphs and achievements of other bloggers and if they choose hold virtual hands in friendship across the world. I feel very blessed to share blog world with all of you. And as for what happens when bloggers get together...well maybe it should remain a secret...but suffice to say we do have fun. My little blog started almost two and a half years ago and basically it is a record of the quilty, stitchy and crafty things I make. There are so many wonderful creative bloggers out there who, so very generously, share their talents and projects with us and so each day I like to feature a link to a free project shared in blogworld...just like this one. And boy do I love this one. This is why I am learning to crochet this year. I want to ...no...need to make these. Here's the LINK to the pattern at truly beautiful The Stitch Pattern. Many many thanks to Shari for sharing this beautiful pattern with us all. Little Henry went home today (gee this house feels empty) so I had a peaceful evening sitting and sewing and watching a couple of episodes of Inspector Frost. I spent the evening sewing some hexie flowers onto their background squares. It's also great to spread the news about things others may enjoy, so that's just what I do here. 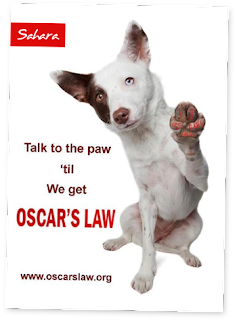 Please let me know if you are involved in something you would like mentioned HERE. A special hello to Cornelia at Mummy and Me Stitching and pats and kitty kisses to her kitten, Susie. Cornelia is new to Melbourne, so please pop over and say hello especially if you are a Melbournian. You can also meet her at fabulous Sewn and Quilted, where she is one of the workers. And finally I'm having a little giveaway to celebrate Grow Your Blog day. 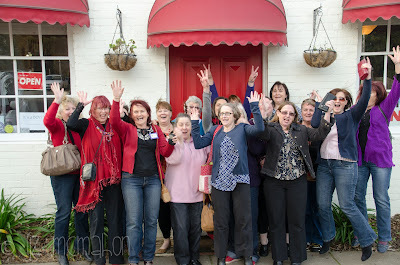 Last year I went to a brilliant bloggers day in Ballarat called Crafty Hijinks. It was organised by Jodie from Ric-Rac and Gillian from Silly Gilly. I was lucky enough to win the most brilliant basket of Ric-Rac goodies in the Raffle and I thought I'd share a little of my good fortune today. So if you would like to win four of these amazing Ric-Rac patterns just leave me a comment on this post. You will have until Jan 30th to enter and I'll announce the winner on January 31st. I'm happy to post anywhere in the world. so that is exactly what I will do. This gives everyone a bit longer to enter which is great. So entries will close on St Valentines Day, February 14th. Good Luck. Once again enormous thanks to Vicki for organising today's fun. Thank you very much for visiting me. If you are a new visitor hope you will call back again and if you are a regular reader - thank you so much for being part of my bloggy world. I am a regular and I come back every day to see what you've been up to! What a great post! I love following your blog, I can hardly believe it's only been 2 and a half years. I've never heard of Ric Rac patterns. I'd love to be entered in your giveaway! Great post Mel. Just think, if it wasn't for blogging, you and I would never have met. We certainly do get up to lots of fun (I won't say mischief! ), don't we! I do love stopping by your blog to see what you're up to... and to see which tutorial you've discovered and are sharing with us. 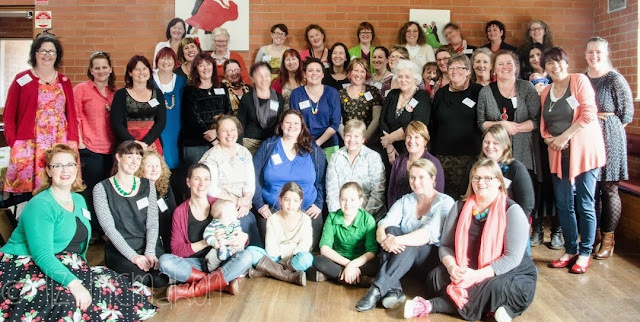 One day, I will time a trip to Melbourne to come to one of the sewing get-togethers. lovely post Mel... so you.... hope you get lots of new visitors... please dont add me in your giveaway being a regular visitor! Great post. I read your blog all the time. Love the free stuff :-) Please enter me in your giveaway. Hi Melody, thank you for the lovely Hello :) I have just popped a new post up that includes photos of little Suzie so you can see what she looks like :). I would never say no to being entered into the giveaway also, I love Jodie's patterns! Have a great weekend. Visiting from FNSI. Lovely hexie flowers. Fussy cut looks great! You definitely should learn how to crochet! I have recently learned how to and it is surely fun! --- Happy growing your blog! Am growing mine too hopefully. Love coming to your site to see what has been happening and the free that you link to. Hi Melody, how lovely to find your blog. Can I ask you, what are those most beautiful fabrics you are using for the hexagons you're sewing. They are absolutely stunning. Mel, you have expressed exactly how I feel about crafters and blog land. I have met so many beautiful paople in the craft world and blogging has created a larger world for me. Unfortunately I only get to travel with my quilt groups and don't have the courage to drive further than the Peninsula but at least cyberspace expands the places I visit. I thoroughly enjoy your bright and cheery blog and thank you for bringing much joy to us all. I loved the gathering at the Novotel last year and hope to catch up with you and the Mel Rosie gals again this year sometime. Angel hugs my lovely. Great post. Love your hexies, such lovely fabric. I would love to be entered in your giveaway please. This is a lovely post, Melody, and you are right about all the amazing people you meet. Good luck with your crocheting. Great hexie flowers, too. A great post as usual, Lovely to see some faces I recognise, I agree, Crafty Hijinks was a highlight of my year, thanks to you and Christine. Count me in for the Ric-Rac giveaway, I have blogged about it too. I love Jodi's patterns and would feel very fortunate should Mr R. Generator chose me! Thanks for the giveaway! I love visiting your blog Mel. You are absolutely right about what a special community we have. Hi Mel, a great post as usual, you know I visit every day, looking forward to seeing you soon. We are very fortunate to be part of such a wonderful blogging community. I love your hexies the fabric and fussy cutting are gorgeous . Thanks for all the time and effort you put in to your blog and free links. I enjoy popping in and seeing what you are up to, and following your links. I would love the chance of being in your giveaway, thank you for the chance. Lovely post Mel,love visiting your blog my friend.I too feel blessed to have beautiful friends in blog land. I wish I could come to one of your blogger meetings. It looks like you have a great time and make lovely friends. Always enjoy reading your posts. It was a pleasure to meet some of your blogging friends today. Your free links are great thanks Mel. Maybe one day I will see you at a bloggers meet ? Love your hexie flowers. I don't know Ric Rac patterns so will have to go and have a look. I have hexi-itus too, it's infectious isn't it! Your so right about the kind crafting folks you are able to meet from all round the world online. I already love your blog and drop by to see your new sewing sometimes. I especially like your link in each post to another special project. Thank you for sharing a fun giveaway. Hi, I'm Linda from craftygardener.ca and I found your site from the Grow Your Blog event. I'd love to be entered into your give away. Stop by my site and enter my give away too. It has been nice browsing through your blog. 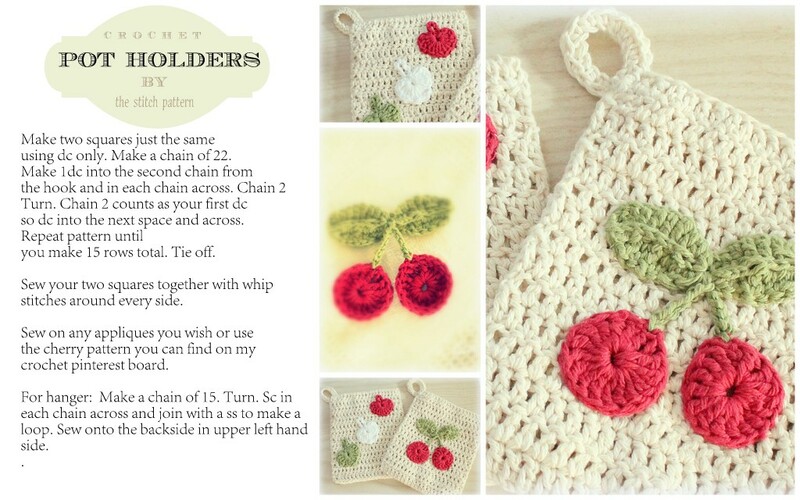 I've been following you for a while - I love the cherry coaster, maybe I'll have to learn to crochet too! Nice to meet you Melody. I love your blog graphics. They grabbed me from the start. Looks like you have a fun group and do many fabulous things. I hope to find that kind of support where I live someday since I just retired not too long ago. Thanks for the free stuff link! Hello and wow !! I love your blog header and background.....I sew and crocheyt but cannot quilt yet it is on my list of things to do thank you for sharing that pattern it is a sweetie! The friendly relationships I have formed and the wonderful things I learn and the encouragement I receive are my favorite parts of blogging. I have enjoyed seeing the beautiful sewing projects that so many bloggers make. Thanks for visiting me today - it's such a pleasure to meet you! Hi ... found you at the GYB party .... and glad I did! Your blog is delightful .... and what a generous giveaway! I love the cheery appearance of your blog! Hope you have fun along the way with Grow Your Blog. Cheers! Thanks for participating in the party and for the lovely giveaway! Pick me!!!! Your hexies are wonderful! You and the links you find are such an inspiration! I would love to win some new patterns! Hi Mel, I often visit but rarely comment :-( but just have to say what a lovely post this was...you really have captured the 'essence' of what blogging is all about. Oh, it's fun to see so many smiling faces and see some of your beautiful creations! Happy blogging! Great to meet you! You have so many things on the go and so much creative energy! Better late than never Mel... so please add me into your lucky dip. I think you have summed up the whole gist of blogging and what wonderful benefits and friendships that can be made. so lovely to see your confetti hexies finding their backgrounds. I found your blog on "Quilting Bloggers" and enjoy reading it very much. Thanks for the chance to win some fabulous Ric Rac patterns! I enjoyed my visit to your blog. I love the hexies! Your blogging meet up secrets are safe with me. Hi Melody, a great post with lots to read. Blogging is such fun, it keeps you on track, lets you try new ideas and make great friends. I'm so glad I joined in the fun. I loved your comment along the lines that non-bloggers don't understand the connections made through blogging. A person becomes a dear friend and you've never met her. Thank you for sharing! Looking forward to following your blog! blogging is so much fun and I love reading other's blogs. I always enjoy seeing what kind of free things you find. There are so many generous bloggers that share such great things. I look forward to seeing many fun and surprising things on your blog. Have a another great year. Your blog is delightful and I can feel your infectious, happy spirit coming right through to my computer screen. I also love the fun retro LOOK of it with your darling sidebars and all the color. Glad i stopped by from Vicki's blog party! It is always a joy to visit your sweet blog, Meloday. Your kind links to fun projects and great blogs are a fun must for me to do everyday. Blessings to you. Thank you so much for the wonderful giveaway, and for all you do to bring us the daily freebies. Don't forget to show pics of your sewing room after the redo! Melody your blog is such a happy one to visit each day . Thank you for all the wonderful things you share with us. Love your hexies! I just recently tried out my first hexies, patching our comforter with them!!! My son is laughing at me saying to patch all the holes will end up covering the comforter. Such is life. Crochet is something I keep hoping to learn but so far haven't. Exploring this world of blogs of still pretty new to me. I found them from facebook and seem to be off on a big explore! Thank you for sharing - still so much to learn. Visiting from GYB and am signing up to follow your blog. Love seeing all your projects and yes to the blogosphere. I do so agree about how great it is to make bloggy friends although, as yet, I've never met any for real. thank you for all the free links you provide. Thanks for taking oart in the GYB event. I may not have found you any other way!! I'm so going to be following you! You have lots of wonderful information here & it's inspiring. Thank You for the chance to win those YUMMY Ric-Rac patterns. I'm coming back for sure!! Those ric rac patterns look gorgeous, especially the one I can see with the teapot...don't think I've got a chance with 76 comments already, but you know what they say - gotta be in it to win it! Yu all look like you had a wonderful time! please enter me in the giveaway. Thanks for the chance to win those Ric-Rac goodies! HI Melody, I've got a little behind in my blog reading and just want to say this is a beautiful post about the wonderful world of blogging and crafting. hugs. Thanks for the blog. It is always fun dropping by to se your work and what you and friends are up to. Love you and love your blog Mel. One day I shall meet you and my other Aussie friends in person and give you the biggest hugs! Cute stuff- thanks for sharing! And yes, I too am inspired by the quilt tutorial you posted! Hi Melody. I have enjoyed looking around your blog and will be back to visit. Thank you for the giveaway. Great blog, I like your fussy cut hexies. I have enjoyed your blog for awhile now and love it. Those hexies are wonderful. Hello, Melody. So nice to meet you through Vicki's GYB. Isn't it fun! I LOVE your hexies - so beautiful, so beautifully fussy cut. What size are they? I invite you to link to Hexie Weekend so other hexie lovers can see your eye candy. I'm a new follower so I'll be back! And you're my last visit for Vicki's GYB party...Happy Birthday YOU! Hope it's wonderful and love your colorful blog...happy, happy, happy. Oh, I do love your work - such a variety - so appealing to see. I have enjoyed reading your lovely blog. Thank you so much for sharing. Happy hopping! Visiting from St. John's, Newfoundland, Canada. Nice to meet you. I've been making my way through the blogs on the hop - almost done!! You have great 'stuff' (favorite word) on your blog. Thanks for sharing. Visiting you from the Grow Your Blog party. So many wonderful blogs to visit. 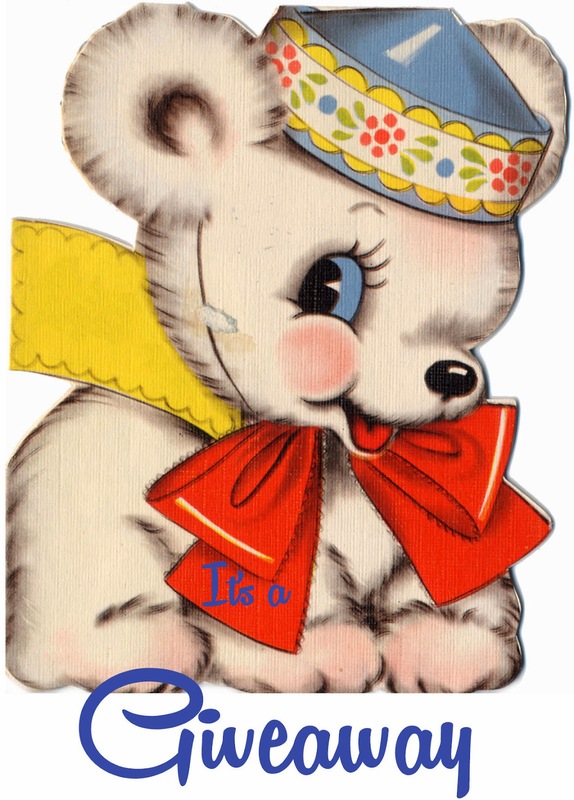 I love your cute graphics, and will be following you and via email. I'm a new blogger, but I agree, I'm finding that the women in blogland are wonderful. I like all things creative n thrifty and I found you from the GYB party. I don’t have a lot of blog time in for I just started blogging when I joined the blog party it was my New Year resolution. 600 entries and I am Reading my 481 blog and more to go. Whew a lot of good read and great giveaways too. I know the importance of having blogging followers so I dropped everything and doing the web work. My site http://overboardcreations.blogspot.com/ and contact info is ovr_brd@yahoo.com I believe inspiration comes from all facets of life even knowing the great people out there with wisdom and knowledge the do's and don'ts and even the wonders of life from a personal point of view. And loving the crafting networks. following you on the goggle connect. Thanks for the opportunity to join your giveaway. Hi Melody, nice to meet you and find your lovely blog. I´m making my way through the GYB list. will be back. best wishes. Enjoyed visiting your blog! Lots if interesting things to read. Total Pageviews. Thank you so much for visiting me. "May your coming year be filled with magic and dreams and good madness. I hope you read some fine books and kiss someone who thinks you’re wonderful, and don’t forget to make some art — write or draw or build or sing or live as only you can. And I hope, somewhere in the next year, you surprise yourself."